This world-famous South Beach destination restaurant/nightclub offers a non-stop “Havana” style party to spice up any trip. 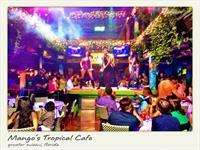 Locals and tourists alike continue to be captivated by this tropical party mecca. Live music and entertainment include everything from Salsa and Conga shows, Mariachis, Samba, a Michael Jackson “Thriller” tribute performance and the exotic and sensual Mango’s dancers. Enjoy naturally made Mojitos and Daiquiris. This is one of the hottest spots to eat, drink and dance the night away from lunch until late night. Live Performances every day starting at 1 p.m.
McArthur to Ocean Drive north to 9th, Julia Tuttle to Collins east on 10th south to 9th, East from Ocean - for swimmers only!